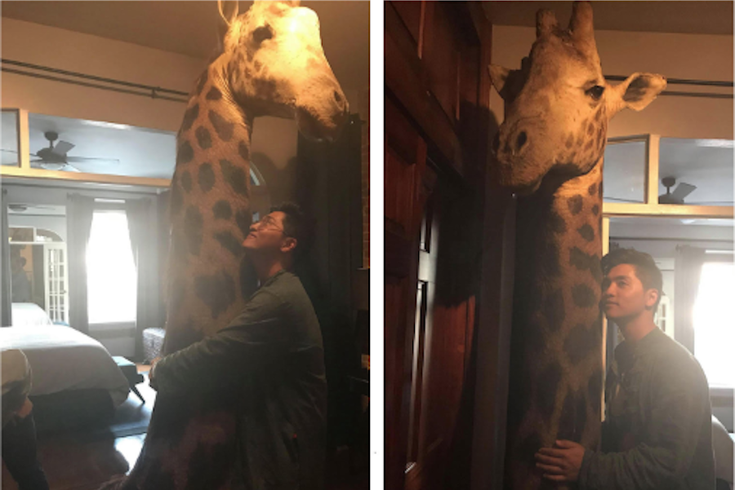 After winning an eBay auction, Jason Tang found himself faced with a peculiar question: could he get the 9-foot taxidermy giraffe from New York City to Philadelphia via public transit? Say you’re into taxidermy and fate would write a script in which you won an eBay auction for a 9-foot by 2-foot stuffed animal. Imagine then that your transportation choice from New York City to Philadelphia is public transit – specifically the railways operated by New Jersey Transit and SEPTA. This is a peculiar predicament, and one for which there really isn’t a handbook to consult. If you’re anything like Jason Tang (aka Juke Terrific), you’d likely take your query to the good people who might see it on Facebook and then share it on Twitter. That’s what Tang did late last month, posting on Facebook groups like "Old Suburban Boners for Car-Owning NIMBY Homeowners" about his situation. Few of us have, to the point that the post drew quite a bit of attention including mine, thus prompting me to reach out to Tang and various regional transit agencies to better understand the rules governing such an odd request. I suppose this is understandable. In a world rebelling against manspreading and leaving one's bags on empty chairs on public transportation, a huge stuffed giraffe head might be seen as intrusive. “Unfortunately, an item of that size would be too large to transport on NJ Transit,” said Kate Thompson, senior public information officer for the agency. Andrew Busch, SEPTA’s chief press officer, had “heard some chatter about this” situation, as well. What a shame for Tang, who is still working on a plan to get his giraffe head home to Philly. “I didn’t end up transporting it yet because it was flaking,” he shared of his fear of trying his luck without getting formal clearance. “So, I think I need to get a car." Now, you're probably thinking what we were thinking when we first saw this: what the heck does Tang need with a giraffe's head? Good luck with that, Jason!